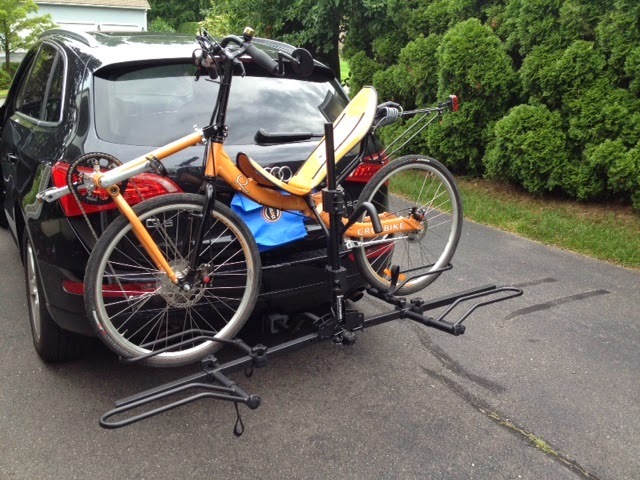 I get a lot of inquiries about how to put a recumbent bike on a bike rack for a car (car rack?). I update this blog post whenever I hear a recommendation from a rider about a car rack they use. If you think your bike rack works well for recumbent bikes and/or trikes, please send me photos, brand and description so I can post it. I have been enjoying my [Cruzbike] Quest bike. I wanted to give you some feedback on what I discovered about bike racks to carry the quest. Thule has a hitch carrier that has a spring loaded upside down U-shaped arm that will hold the front wheel and I believe that it has movable wheel wells. This carrier functions to hold the bike in a similar fashion to carriers I have seen on the front of some buses. I don’t know the model number but I was able to mount the bike on one at a show room. The rack I did buy was somewhat less expensive but seems to work quite well is made by Hollywood Engineering Inc. (www.hollywoodracks.com). My rack is Model HR1000R – two bike capacity MSRP $319.99. It works pretty well, will hold two recumbents securely with minimal mounting effort. To use it for my Quest I remove the two finger nuts which hold the seat to the horizontal bike tube. I will take a photo of the bike on the rack and forward it later. One of my customers with a Street Machine Gte likes the Inno INH330 Aero Light QM rack from Inno. It looks like it is kind to wheels. 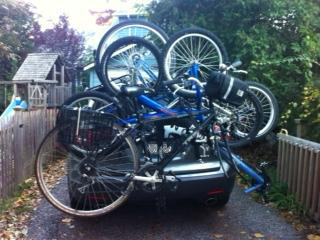 “Attached are the pics of the bike on the car. My kids spend about 3 hours on saturday mornings at a kind of extra-school thing about 15 miles from home, and I drove there with the bike on the rack so I could go for a ride. You’ll see the pic that we took with it on the rack in brooklyn, with the seat, and then one I did at home without the seat. I found that I needed the seat off to accomplish the most interesting picture … the SMGTe as one of FOUR bikes on the rack. I think that this was only do-able because my kids bikes are small (16 inch wheels), and that once they move the bigger bikes I’ll need to take everyone’s wheels and pedals off but it should still work. The recumbent’s handlebars are the biggest problem. I also attached a pic of how I attached it to the rack … with the seat off and needing to fit all 4 bikes, the center of gravity is WAY off and it was stressing that rubber safety belt. I used some sailing line that’s meant for heavy loads and tied it with a square knot (gets tighter as pressure is appplied but still easy to untie), so that it was that line rather thant he rubber belt was taking the weight. Wow, now that’s a load o’ bikes! One of my customers loves this brand. I like them too because they don’t require a lot of upper body strength to hoist the bike onto the rack. Made in the USA. Lightfoot Cycles has a nice article about car racks. ← Riding in the winter. Here’s what you need.